The quality of juvenile salmon rearing habitat in streams is determined by a complex mixture of temperature, food quality and availability, competition and predation. Growth is often considered an indicator of a stream's health, but a new study that will be published soon suggests that just looking at growth limits our understanding of the stream. "Growth in fish -- increase in body size -- is a complex process that is influenced by a suite of factors," said Paul Chittaro, research biologist with NOAA Fisheries' Northwest Fisheries Science Center. "We show that similarity in growth can occur among fish from several streams despite differences in stream water temperature. Therefore, solely using growth as a metric of habitat quality could fail to detect ecosystem differences." The study, "Spatial and temporal patterns of growth and consumption by juvenile spring/summer Chinook salmon Oncorhynchus tshawytscha," will be published in the Environmental Biology of Fishes. The publication date has not been determined. Authors are Rich Zabel, director of the Fish Ecology Division; Beth Sanderson, manager of Ecosystem Analysis Program; Paul Chittaro, research biologist; Kerri Haught, fish biologist, all from NOAA Fisheries' Northwest Fisheries Science Center in Seattle; and Brian Kennedy, associate professor in the Department of Fish & Wildlife Sciences at the University of Idaho. "The genesis of this study was the desire to understand growth in fish, in particular, to understand what factors contribute to variability in growth," Chittaro said. "Growth is viewed as important because fish that grow larger and do so quicker are more likely to survive, and these relationships are common among rivers and species." Over several months the study looked at four populations of threatened salmon in the Salmon River basin in Idaho, measuring temperature and growth, along with time. The four streams had wide variations in temperature, yet juvenile salmon growth did not appreciably vary. It found that the relationship between growth and temperature is also influenced by the abundance of food. "Therefore, a more mechanistic understanding of how these components interact to influence growth can provide a deeper understanding of how growth responds to ecosystem variability," the report says. "Understanding these relationships is particularly important in assessing the potential impacts of major anthropogenic disturbance, including climate change, on ecosystems." The variability in growth among juvenile salmon populations during the summer was determined by analyzing otoliths from fish removed from the streams in September, at the end of the study. An otolith is a bone located in a fishes' head. According to Chittaro, the bone is "unique in that it is formed at birth and grows microscopically throughout a fish's life. The otoliths in chinook salmon grow daily, and this daily growth is visible under a microscope as a ring -- similar to rings of a cross-sectioned tree. The width of these rings is positively related to how much the fish grew. So, we can estimate how much a fish grew when it was younger by using the number of rings and width of rings on the otolith to reconstruct an individual's earlier age and growth." So, growth was measured by the authors by back-calculating or reconstructing actual growth using the rings of the otolith. This also allowed the authors to match the daily temperature data they gathered with actual growth over time. Water temperature during the study ranged in the four streams studied from 5 to 18 degrees Celsius for Marsh Creek, 6 to 22 degrees C for Valley Creek, 8 to 19 degrees C for Elk Creek and 4 to 17 degrees C for the South Fork of the Salmon River. Elk and Valley creeks experienced temperatures 2 to 5 degrees C more than the other two tributaries. Still, temperatures in the four streams were all below the 19 degree C optimum for chinook salmon. According to the study results, food consumption by juveniles is driven by water temperature. The greatest decrease in temperature (Aug. 21 to 28) saw the greatest decrease in food consumption rates. Fish from the warmer Elk and Valley creeks consumed more food than fish from the cooler Marsh Creek and South Fork of the Salmon River. 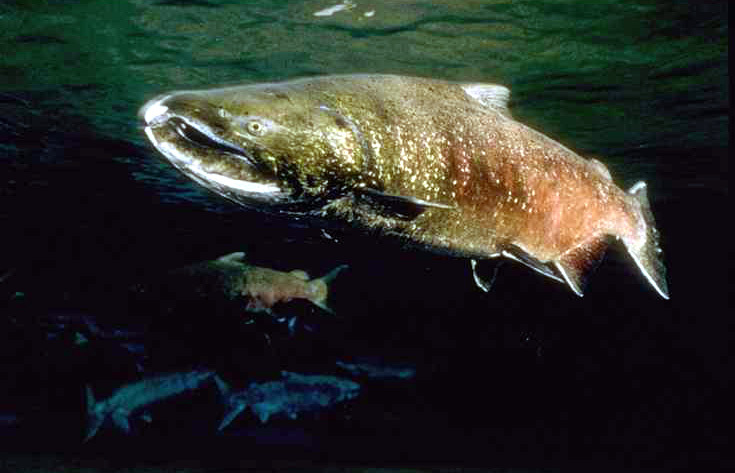 Further, the amount of prey (food) energy density impacts the amount of food the salmon will eat. The higher the energy density of the prey, the lower the consumption rate by the fish. The energy expended by the fish to consume the prey also has an impact: a "six-fold increase in activity multiplier resulted in approximately an 18 percent increase in consumption." The growth rates did not vary substantially among the four populations, according to the study, but due to stream differences in temperature, consumption rates did differ. "These results demonstrated that using juvenile growth exclusively as a measure of ecosystem or habitat components misses fundamental differences among ecosystems," the report says. "Several disparate ecosystem components can lead to the same growth rate, and thus growth is not always a satisfactory measure of juvenile salmon habitat." This type of information, the report asserts, is crucial in providing insights into how these and other threatened populations of salmon will respond to conditions as climate changes. In addition, the information can guide mitigation actions that would improve growth rates in Northwest streams.